April Mailbag – Profiling Pastore, Scouting Lukaku Replacements, and Should Spurs Tank? It’s monthly mailbag time! I now get enough good questions each time I throw out a request, that this column has gone monthly, and I still can’t get to all the good questions (and this time I had to break the whole thing into two parts). So you guys keep up the good work and I’ll try not to sound stupid while answering the questions you peppered me with. Javier Pastore was one of the hottest prospects in Europe in the summer of 2011. He’d just come off a season at Palermo where he posted 11 goals and 5 assists and helping lead the club to the Europa League. PSG stumped up nearly 40 million Euros to bring him to Paris, but since that time, reviews on his performances have been mixed. I have to admit, I’ve never looked at Pastore’s stats in detail. For me, he’s sort of connected to Alexis Sanchez as young players who lit up Serie A, and then moved to big clubs for big fees. I looked at Alexis’ stats briefly about six weeks ago, and he’s incredible. Pastore is… well, you’ll see. 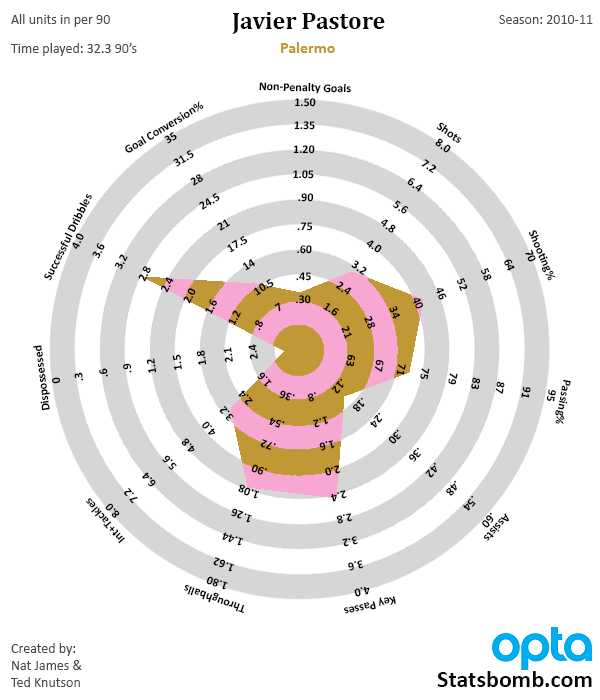 So this is Pastore in his last year at Palermo. These numbers are very good for a second striker or attacking mid, and those key pass and throughball stats are actually elite. And here’s the five-year comparison of his time at Palermo and PSG. So to answer the first question of was Pastore good in Palermo, the answer is: absolutely. He was 20 and 21 years old when he produced those stats, which is exceptional. The complication comes when you look at what position he played. According to @11Tegen11, At Palermo they were running a 4-3-2-1 and Pastore was one of the 2 behind the striker. To me, this feels a bit like a David Silva type floating position, where he can go wide when play warrants, and has a ton of freedom to be involved in the attack. 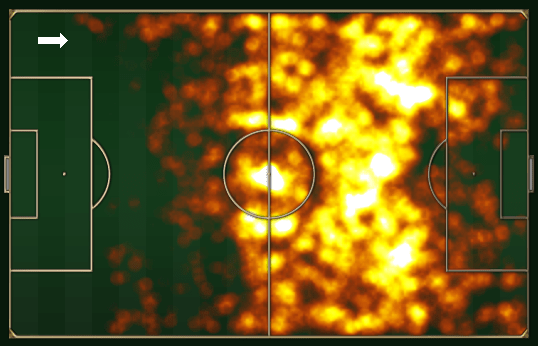 Here’s his heatmap from that season (courtesy of Albert Lacarda of Tru Media and ESPN Stats and Info), which shows that he was indeed all over the place. That said, a straight two behind a forward is a fairly unusual tactical setup in the modern age, and it’s likely not where he has played at PSG. Has Pastore been good at PSG? Well, he was certainly good his first season when he posted a G+A90 (Goals + Assists per 90) of .65 and he wasn’t a primary scoring option. Dribbles fell by about 1 per game, but the key pass numbers stayed high, as did the throughballs (also known as the type of passes most likely to lead to a goal). The next season is more up in the air, as the scoring contribution was only .46, but he was doing a ton of work defensively, posting the highest I+T90 numbers of his career. This year? WhoScored lists him mostly as playing a central midfielder, so the reason why his numbers look nothing like they did before is because… he’s playing a totally different position. I’ve mentioned it before, but it bears repeating. If you buy a player based on stats and performance at one position, and then change the position they play, you can’t expect to see the same production. The important question now is: Can Pastore still be great? On the plus side, he’s pretty young. Pastore turns 25 this summer and is just coming into his prime. If a team wanted to take him and play him as an inside-out attacking midfielder or a full number 10, I think they could get a ton of value, provided they paid a reasonable price. He’s obviously very talented, can dribble, has great technique, and is an elite attacking passer when put in the right position. Obviously you don’t want to pay 40M for him like PSG did, but his contract is up in 2016, and PSG might be willing to let someone take his wages off their hands for half that amount. I would be very happy if he was on the left side of the Arsenal attack, and he and Mesut Ozil were running regular overlaps. Put Walcott and a forward with actual speed on the other side of the Arsenal attack, and you’d have a team capable of scoring with the best of them. You know… unlike this year’s Arsenal which is still TENTH IN THE LEAGUE IN SHOTS PER GAME. Back at the start of the season, I criticized Everton’s recruiting when basically everyone else in the world was singing their praises. The reason I did so is that the cost for the Lukaku and Barry loans was publically reported as costing the club £10M in fees and wages, which is a fairly ludicrous sum for a club of Everton’s size (only £80M in total turnover) to pay for a one-year rental. Buying kids, coaching them up, moving them on at a sizeable profit, I could understand. Renting a veteran like Barry, 32 years old at the time, for 6.5M, I could not. If they’d gotten Barry for half wages of say 3M plus Lukaku for the same, then I probably would have shrugged and wished them luck. I also hated the signing of Arouna Kone at a rumoured 6M plus wages, but instead of evaluating that particular one, we get to play the “he blew out his ACL card” and go no further. My judgment was that Martinez and co were taking a fairly sizeable gamble that would only pay off if they recouped the revenue by qualifying for the Champions League this season. Paying for Barry cost Everton the chance to sign a few younger talents now that could pay off handsomely in the future. Leveraging future success for current success is normal, especially in football, but I tend to think it is a losing proposition the bulk of the time. Aaaaanyway, Everton are currently in the mix for fourth right now. Granted, they are still underdogs to get there due to the strength of teams they still have to face, but there’s a chance. Has this changed my opinion at all? In a word: no. My opinion was based on process and not on outcome, so the fact that they could reach a positive return on their gamble doesn’t change the fact that – in my opinion – it was a negative EV wager. However, if they do get there, I have also promised to publically congratulate them on their success, and especially on the fact that they recruited Roberto Martinez, who has been even better than everyone expected. That also won’t stop me from thinking this type of thing is a stupid move the next time some club does it, which will assuredly happen again. It’s possible that loaning veterans to fill roles that you can’t recruit for is a reasonable strategy for teams to employ. However, price – and that means the entire cost of the deal, not just the sticker price on a transfer – always matters. Another Everton question… I sense a theme. Technically this question is sneaking ahead of the research I usually do in May, but because it’s an easy lookup, we’ll tackle at least a small part of this today. The answer to this one is that replacing Lukaku might be impossible for Everton’s budget. In essence, you’d need to find a young player who is scoring at a rate that would be in the Top 40 in Europe, can maintain that in the Premier League, and who they could buy for no more than say £15M. Tricky business. 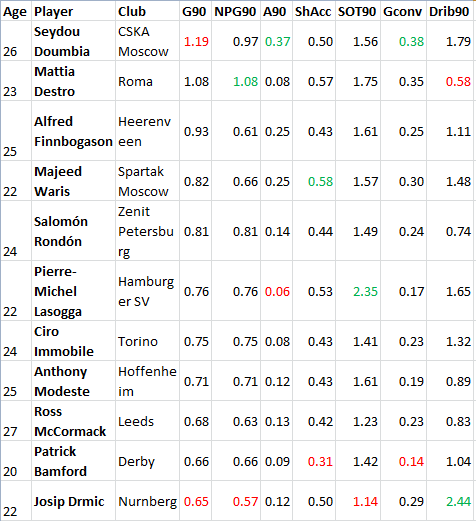 Not one to be daunted by seemingly impossible tasks, I attacked ye olde database (filled with Opta stats from the big European leagues for the last season), and here are the names I found that could be candidates. So we have a list of 11 players that are all in useful age ranges. The ones at the outskirts like Doumbia or McCormack are there because they have crazy production. Doumbia’s is boosted by nuts conversion numbers, but he’s got good assist stats to back it up. McCormack is the Championship workhorse that is stuck in the madhouse at Leeds and could be available for a discount. He probably should have been brought to the Premier League a few seasons ago, but that type of transfer rarely seems to happen these days. After that I tried to focus on younger players that could potentially be available. Destro has blown up at Roma and would cost too much now, as would Immobile. Finnbo plays in the Eredivisie, so you’re dealing with “scored well in the Dutch league, but…” translation issues. Buyer beware. Rondon is a young superstar that was kidnapped from Malaga and whisked away transferred to Russia a couple of seasons ago, but has carried on scoring well in Russia, which is another league that gets Buyer Beware stamps regarding attacking transfers. In my opinion, none of those are very interesting for our purposes, despite the fact that they pass the stats filter. The other names on the list are definite contenders. Lasogga is on loan at Hamburg and will be coming into the final year of his contract. He’s a battering ram player who is a bit like Lukaku, has the highest shots on target per 90 of the lot, and could come cheap(ish). Modeste is a player I thought should probably have been bought last season by certain PL clubs, but he’s been doing well at Hoffenheim, who appear to have completely eschewed any semblance of defense during their Bundesliga season. If either of these can be had at 7-10M euros, they would probably be worthwhile. However, the really interesting names in that list are Drmic, Waris, and Patrick Bamford. Drmic I wrote about last week as an Arsenal target. He’s supposedly got a relegation clause in his contract that would make him available for anywhere between 2.5M to 8M euros (no one actually knows), and he’s definitely a talent. The same goes for Waris, who is owned by CSKA Moscow, but on loan at Valenciennes right now, and his stats are from Ligue 1. His goalscoring is also fuelled by a high conversion rate, but he’s only 22, and everything else there looks interesting. I’d definitely have scouts take a closer look. Finally, you have what I consider to be the most likely scenario – Patrick Bamford. Why? Because Bamford is tall, athletic, and scoring at a great rate in the Championship despite a mediocre conversion percentage at only 20 years old. That age plus those stats… Bamford could be amazing in 3-4 years time. Like Lukaku, he’s also owned by Chelsea, and one suspects that they would be willing to loan Bamford to Everton’s finishing school for a season on the cheap, which falls in line with Everton’s financial planning. The problem with this scenario is that unlike Lukaku, Bamford is actually an attacking midfielder and not a true forward, (which also helps explain his conversion percentage: wide = harder). However, Everton might need to replace Delofeu if Barce take him back, or they could run Bamford on one side, Delo on another, and Mirallas through the middle as a false nine. And these names are just for the Euro leagues I have data for. There are probably plenty of potential stars out there who are playing in smaller leagues, or who didn’t meet the games played threshold to show up in the search. It’s not impossible to find forwards with the potential to put up good numbers who could also be had at a discount. You just need to know what stats matter in finding them to know where to start your search. For those Europeans who are not familiar with the concept of tanking, it’s defined as intentionally losing games soas to finish lower in the table. American teams do this because they don’t have relegation, and the worse your record is, the better the odds that you get a top pick in the collegiate draft. It’s done mostly in the NBA, but the NFL has some issues with this as well. Unless you magically get transported to the late knockout stages completely healthy, playing in the Europa League creates an injury production line that can seriously hamper performance in domestic league and cup competitions. This is all while providing very little financial boon, and in some cases, considerable additional travel stress. Thus, I hate the Europa League as it currently exists, and I particularly hate when clubs actually play their good players away from home during the group stages. The only way you can get away with this is if you have a huge squad like Manchester United do, which is something Spurs do not have. Objectively, if I were running Spurs, I would absolutely make certain we did not win enough matches to qualify for another go round in Europe’s second finest league. That said, Spurs are dealing with a lot of weird incentives. First you have really grumpy fans who are irritated at the manager merry-go-round. They also seem irritated by the production of their Gareth Bale replacement crop, and they seem generally irritated by Levy’s bald head. My gut instinct is that the real source of their anger is the fact that they are Spurs fans in the first place, but I don’t have any data on that. Also on the weird incentives list is that fact that Uncle Tim Sherwood would clearly like to manage again some day, despite the fact that his team and tactical selections often look as if his personal motto is #YOMO. To potentially get a ride on the manager-go-round again, he needs to win games, not lose them. 59 points, a goal difference of 0, and miniscule production from their £30M and £28M signings. AVB quits/gets fired, Spurs can’t find a reasonable replacement, and Tim Sherwood takes over for the rest of the year. And they are STILL ahead of Manchester United in the table. This Spurs season is just weird. I covered this briefly last week when I tabbed Pochettino as the best possible replacement. The fact of the matter is, there are plenty of fine candidates out there beyond Louis Van Gaal that I think could produce good results. I like Ajax’s Frank de Boer, who has won four straight titles at Ajax and should certainly be ready for new challenges. I like any of the German trio of Weinzierl (at Augsburg), Tuchel (Mainz), or Thomas Schaaf (who used to do great things with Werder Bremen). I even don’t mind the concept of Luciano Spalletti, who has done fairly impressive things with Roma and Zenit in the past, and generally favors a 4-2-3-1, which is probably the system Spurs personnel fit best in. At the end of the day, there are plenty of good options that are slightly less scary than van Gaal in terms of the personality vs. crazy factor, and all of them are better options than Sherwood. If van Gaal bolts for Manchester United or somewhere similarly high profile, it ain’t no thang. Check back tomorrow for part 2, which will include a player break down of Joao Moutinho, some thoughts about the English Championship, and some fullback scouting for teams in the Premier League.